Manage all the ways you send and receive payments for goods and services with PayPal. It's all here – in the palm of your hand. A faster way to send payments. 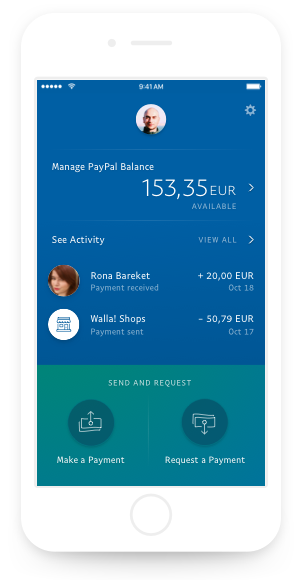 Send payments for goods and services to PayPal users around the world, simply by using their email address. They can spend the funds online or simply withdraw it to their bank account. All your eligible purchases are covered by our PayPal Buyer Protection. Send a Detailed Payment Request that allows your customers to pay you with just a tap. Whether you’re looking to get paid for a service you provided or something you sold online, we make it easier for them to pay, and for you to collect. Your PayPal account is in your pocket.